It’s almost the end of summer. Watermelon is cheap and at its peak of deliciousness, so when you see a ginormous watermelon at the farmers market for $4, you buy it. And then you realize that you have a LOT of watermelon on your hands. What are you going to do with it? Well, here’s your answer: 4 simple watermelon side dish ideas. They’re healthy and easy too! Okay, I know most people would be inclined to add feta to this. Well, I don’t like feta! Toss some cubed watermelon with fresh basil leaves and some halved kalamata olives. If you’re a fan of sweet-and-salty, you will love this salad. 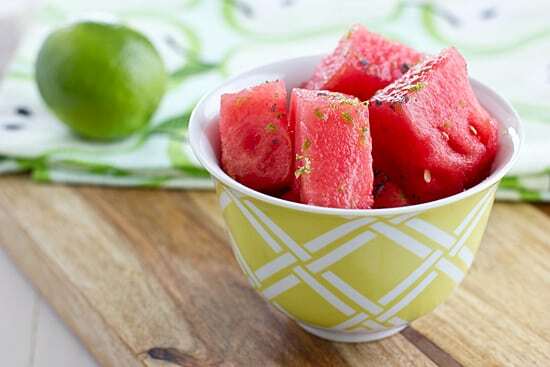 Squeeze fresh lime juice over watermelon slices and sprinkle with coarsely chopped mint leaves and a few pinches of sea salt. 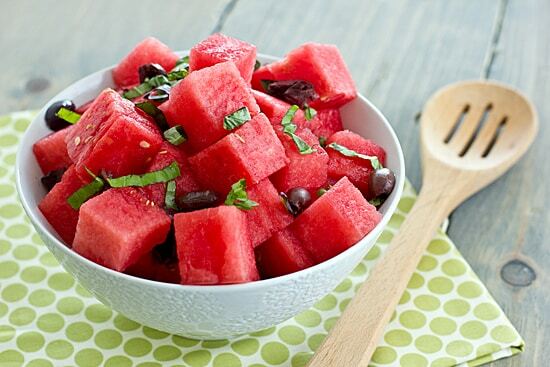 Watermelon slices never tasted so good! The perfect side dish for taco night! Seed and mince a jalapeno and chop some cilantro, then toss it with cubed watermelon and a drizzle of extra virgin olive oil. Sprinkle with a dash of salt (I used black sea salt, in case you were wondering what those little black flecks are in the photo). Is your watermelon a wee bit under-ripe? It’s okay! You can fix that! Combine 1/4 cup of sugar, 1/2 cup of water, and a 2-inch piece of ginger (peeled and sliced into coins) in a small saucepan. Bring to a boil over medium-high heat, then decrease the heat to low. Simmer for 10 minutes, then remove from heat. Once mixture has come to room temperature, pour it through a fine mesh strainer over about 6 cups of cubed watermelon. Stir in zest from one lime and serve. What’s your favorite way to serve watermelon? Hm! 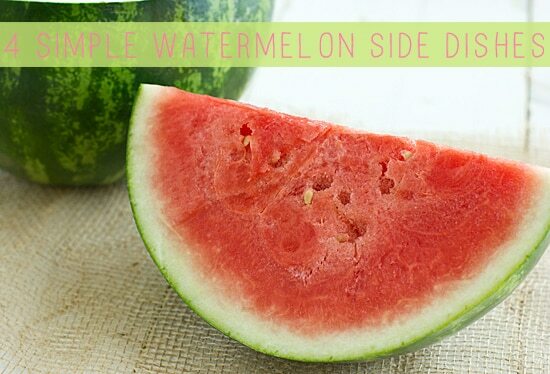 I never thought of the fact that you can use watermelon as a side dish, and as anything except dessert, really! During the summer, I love having fruit as a side dish. I usually just want light meals and that’s perfect! These all look and sound great. I guess this shows how creative I am – I never thought of serving watermelon any other way than straight up! 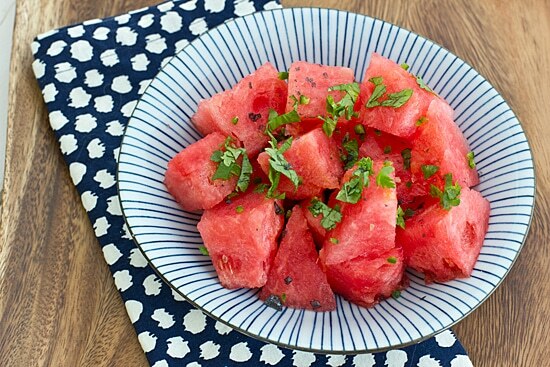 I love straight up watermelon too! But an infused simple syrup is so good for when you get watermelon that’s not very sweet. Basil or mint would also work instead of ginger. I love watermelon and it’s great to try out new things with it – I recently made a watermelon-cucumber gazpacho which was delicious! My favourite way of eating watermelon is together with feta cheese as either an entrée or a dessert or just as snack. I’ll definitely try one of your ideas! I have never been a huge fan of watermelons although blending in a juice, smoothie, or icee is always refreshing. 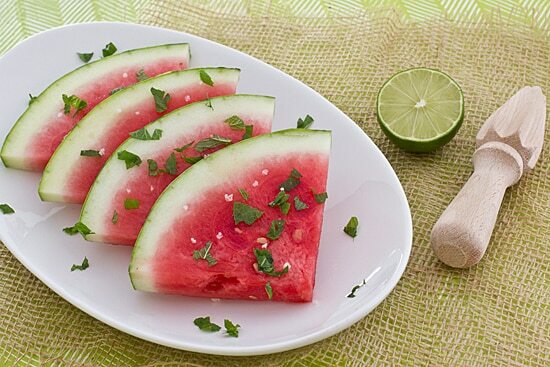 I would not have done all these ideas, but now I find myself craving watermelon dishes…hmmm! Gonna try these with the kids and see what they think too. I hope you like them if you make them! There are quite a few fruits that I don’t care for on their own, but if they’re prepared the right way, I love them. Lately I’ve been having watermelon with feta cheese! I am working out side at a garden centre all day and watermelon with feta is the most refreshing snack after being out in the heat. It’s the perfect combination of sweet and salty.